We have different Projects that support the work we do and will help us continue to serve our children and ensure their safety. Dirty water kills more children than war, malaria, HIV/AIDS and traffic accidents combined. Clean water gives children a chance to live healt﻿hy lives.﻿ 443 million school days are lost each year due to water-related diseases. We drilled a bore hole on our property so we can have clean water for the kids. It was not surprising that at a depth of 15 meters, the diggers encountered several stones because Epworth is extremely rocky. Though the stones were blasted, there was yet another big rock covering the whole bottom and when a hole was drilled, water only trickled out. The stones and rocks the diggers encountered, have significantly increased the costs, way over our initial budget. On the bright side, we feel the deeper the well, the better the purification of the water. The depth of the well though, brings in an added cost to bring the water up. Right now we only have access to a small amount of water and in the summertime the water reserve dries up. To date we collect ﻿water from our neighbours but this has proved to be cumbers﻿ome for the ladies who do the cooking. With our own water supply we will be able to monitor and control the quality of our own water. 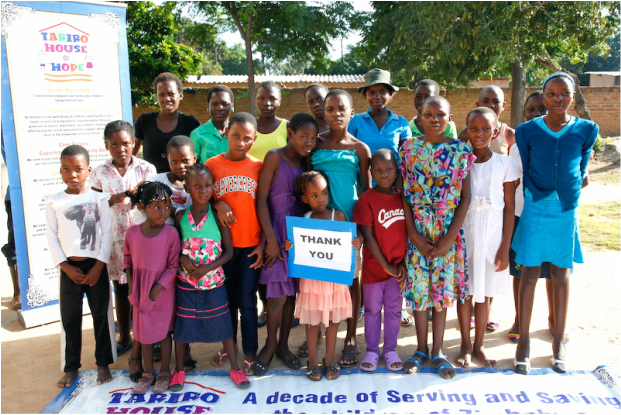 At Tariro House of Hope we are dedicated to providing equal opportunities to the underprivileged. With that in mind we launched Free to Reign on March 16th 2014, a brainchild of our Director of Communications & Development Ms. Julia Chanda Zvobgo. A lack of proper sanitary protection causes social embarrassment and/or isolation. At times girls and women resort to unhygienic alternatives e.g. newspapers, rags, mattress stuffing, leaves, cornhusks and bark as a substitute. This leads to infections, an increased risk of contracting STIs such as HIV. It can also lead to infertility. The price of sanitary pads in Zimbabwe ranges from $1 USD to $5 USD depending on the brand and quality. Recent surveys by the Integrated Sustainable Livelihoods have shown that thousands of young girls miss up to 24 weeks of school because of their inability to control their menstrual flow due to lack of access to affordable and healthy sanitary wear. THH’s then Operations Manager & Counsellor & met with our girls in March 2014, she met the girls from Grade 4 to Form One. The counselling session gave our girls the opportunity to ask many questions about the myths and reality of womanhood. With our donors support each THH girl will continue to receive 1 pack per month and additional packs (according to need). At THH we want all our girls to be free to live healthy lives, free to live in dignity, free to excel and free to reign in all areas of their lives. We are avid about empowering girls and women, which is why this project w﻿ill benefit all THH girls who need them. On a good day the children eat outside sitting on stones or on the ground. When it rains the children cram into the living room to eat their meal. We have enough space on our property to build a decent Cafeteria furnished with dinning tables and chairs. The Cafeteria﻿ ﻿will double up as a study hall for the kids to do their homework and receive extra lessons. ﻿Almost a million children in Zimbabwe have lost one or both parents to AIDS and 12500 children are living and working on the streets. THH owns a house which acts as a central point for feeding and monitoring the children's wellbeing. Our hope is to transform the house to a home for displaced orphans and vulnerable children. We need to make a number of required changes to the THH house and build more facilities to house children before registration. This is an urgent need because we support orphans from a Child Headed Household and they rent a room in a house with 15 other people. Our desire is to keep the children safe and in school. Acquire beds and bed linen. 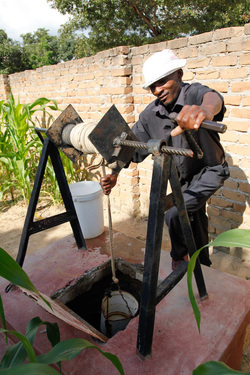 Finish digging a well to provide water for daily use. Instal swings and other playing equipment for t﻿he children. And help us raise funds so we are able to meet the requirements for registration. Contact us here if you can help with any of these projects.